All our hot tub covers are made bespoke to meet your specific requirement. We have a choice of vinyl skins and a complete range of configurable insulation options to meet your specific requirement; from one of the lowest cost, best value covers available anywhere, through to a deluxe fully insulated cover suitable for the coldest ski chalet. Hot tub cover delivery is free if you live in England or Wales. If you live in Scotland delivery costs just £24.95 (excluding IV, AB, KW or PH post codes). if you live anywhere else you can see the replacement cover delivery charge here. The delivery charge will be added when you check out. If your hot tub cover is heavy or sagging in the middle it is water-logged. It won't be insulating properly and it needs replacing! What HOT TUB COVER Options Do We Charge Extra For? The prices above are for a minimum of 4" (102mm) high density insulating foam, which is tapered down towards the edge of the cover to allow rain to run off. If the cover isn't tapered rain water will pool in the center and before long the cover will begin to sag in the middle. The bigger 3 section hot tub covers and the swim-spa covers are made with thicker foam as standard in some sections so that a continuous taper from the center of the cover can still be achieved whilst keeping the outer sections of the cover to the 4" (102mm) thickness. Where possible we offer the option to upgrade to thicker (and therefore higher insulating) foam if you wish. Click through on the buttons above to see the options available for your cover. The covers are all supplied with heavy duty polythene wrapping surrounding the foam core, which is permanently sealed to ensure complete waterproofing. However, it is this polythene wrapping that is usually the first element to fail on a cover. This is because the polythene is in constant contact with water vapour that contains chemical and the chemical makes the polythene brittle and so it cracks. You can, of course, stop this happening by not using harsh chemicals such chlorine or bromine and switching to one of our kinder and more environmentally friendly watercare solutions. You can also, if you wish, pay a little more to have 2 layers of polythene around the core, which definitely improves the longevity of the cover and is a sensible investment unless you are looking for a really low cost option. All the covers are supplied with heat seal gaskets to stop heat loss at the extremities of the hinges where the two cover halves fold together. When the cover is shut, the two halves seal automatically, which is critical to long-term energy savings. 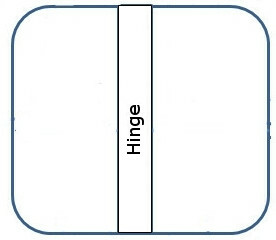 If you wish, you can again pay a small amount more for a continuous gasket along the full length of the hinge. If this sounds a little confusing, you will be able to see exactly what it means when you click through to choose your cover. Each two-part folding cover is supplied with four straps and two handles as standard. If you particularly want more that's fine, but there is a small additional charge. If you have a strange shaped hot tub (ie not a square, rectangle, circle, hexagon or octagon) don't worry, we can still make you a new cover, but we will need you to supply a template that we can use to cut it and we will charge you a bit extra for doing this. If you select our Classic Hot Tub Cover Skin, which is made in the UK, you will be offered the option of express delivery which aims to get you your cover within 10 working days of order (although it might be delayed by a day or two at very busy times). Again, if you select our Classic Hot Tub Cover Skin, you will be offered the option of having us take away your old cover when we deliver the new one. marine grade vinyl with mildew inhibitors and UV-stabilised colouring to prevent fading and provide increased resistance to chemical bleaching. Available in a wide range of colours. rigid, polystyrene, heavy-density, foam core. This is very heavy density foam providing excellent insulation qualities. Please be aware that it is the density of the foam that provides the insulation. This is far more important that the thickness of the cover. tapered thickness to guarantee adequate rain run-off and prevent sagging. heavy duty polythene wrapping surrounding the foam core, permanently sealed to ensure complete waterproofing. reinforced, pocketed, zips, rust and chemical corrosion proof, enabling the foam inserts to be easily removed should they ever need to be replaced. double stitching with heavy-duty, UV resistant, bonded polyester thread. Unlike cotton, this polyester thread won’t rot or degrade in the sun and can’t absorb mildew-causing moisture. 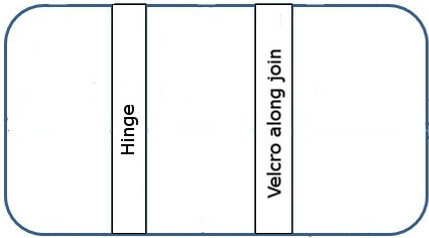 galvanized steel centre channel, c-shaped and running the entire length of each piece of foam along the hinge to provide strength and rigidity. vinyl tie-down straps, with child-proof lockable buckles. The straps are sewn into the cover and onto the skirt to reduce any risk of tearing in high winds. 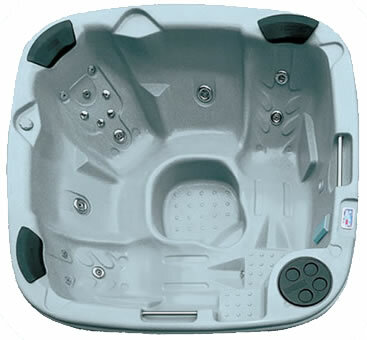 The fasteners can be quickly attached to the side of the hot tub with the stainless steel screws provided. heat seal gaskets to ensure no heat loss at the extremities where the two cover halves fold together. When the cover is shut, the two halves seal automatically, which is critical to long-term energy savings. a comprehensive warranty that covers both material and workmanship. IT HAS TO BE BIG ENOUGH TO FIT! Make sure the measurements are big enough. It is okay for the cover to be a bit big. It still does it's job. However, a cover that is too small will never insulate properly. Don't forget that, even though your hot tub might look square, it might not actually be square, so always measure both the length and width to confirm that they are either the same or different. Always err on the side of adding surface area to the cover and don't skimp on the measurements. Round down any dimensions of cut corners or radius corners. If the radius is too big (ie there is too much curvature) the cover will never fit the corner properly, but if the curvature is a bit too small that is absolutely fine, there will just be a slight overhang at the corners which actually makes the cover easier to get on and off. For how to measure the radius of rounded corners, check out the picture to the right. Above is an illustration of the best way to measure the radius. Measure the distance from the imaginary corner, A, to the point at which the curvature stops, B. Hot tub covers can fit in one of two ways. The most popular is a cover that fits only over the acrylic shell (in a lot of hot tubs, the acrylic shell comes out further than the wood or plastic skirt) and in this case, you must measure from the outside edge of the shell. However, if your hot tub resembles the diagram below, with a wood or plastic sill on the outside of the acrylic shell, and you would like the new lid to cover both the shell and the sill, then you must measure from the outside of the wood skirt. The cover will perform equally well either way, as long as it is big enough to fit completely over the spa shell. X - This is the height of the acrylic lip and will determine the cover´s skirt length if you want your cover to to sit on top of a sill. Otherwise you may choose any skirt length up to 15 cm so that it will easily sit over the edges of the spa with a little room to spare. If you would like a longer skirt that's no problem, just contact us. Y - Outside dimension of the acrylic shell. This is the normal measurement to specify unless you have a sill and prefer your cover to fully enclose it. Z - Outside dimension of the hot tub cabinet. You should use this measurement if you have a sill and prefer your cover to fully enclose it. Your hot tub cover can look way past its best very quickly if it is not maintained and cleaned regularly! Don't let this happen to your investment! Chemical in the water vapour that comes into contact with the cover eventually causes the plastic wrapping around the inserts to become brittle and crack. Once that happens the foam inserts will quickly absorb moisture, become heavy and stop insulating properly. Poor water chemistry can also cause bleaching, puffiness within the vinyl and disintegration of the stitching.